Hailing itself as the first Chinese enterprise to build a long-span bridge in Europe, contractor Sichuan Road & Bridge Group (SRBG) celebrated the official opening of the Hålogaland Bridge in the Arctic town of Narvick, Norway on 9 December. Nestled among snowy mountains, its nearly 1.6-km span traverses the 300-metre-deep Rombaksfjord to connect Narvik with neighbouring towns, and is said to be the longest suspension bridge in the Arctic Circle. Featured in January this year on the Science Channel show, “Building Giants”, in an episode called Arctic Mega Bridge, the project was fraught with challenges for SRBG, who beat large, rival contractors from the US and Europe to win the contract in 2013. The design, undertaken by Cowi, had to contend with the long span, powerful Arctic winds, and thermal expansion-contraction in a region where seasonal temperature swings reach 40 degrees. As contractor and component supplier, SRBG had to contend with a tight construction schedule dictated by Arctic weather, which allows a build period of only six months a year. 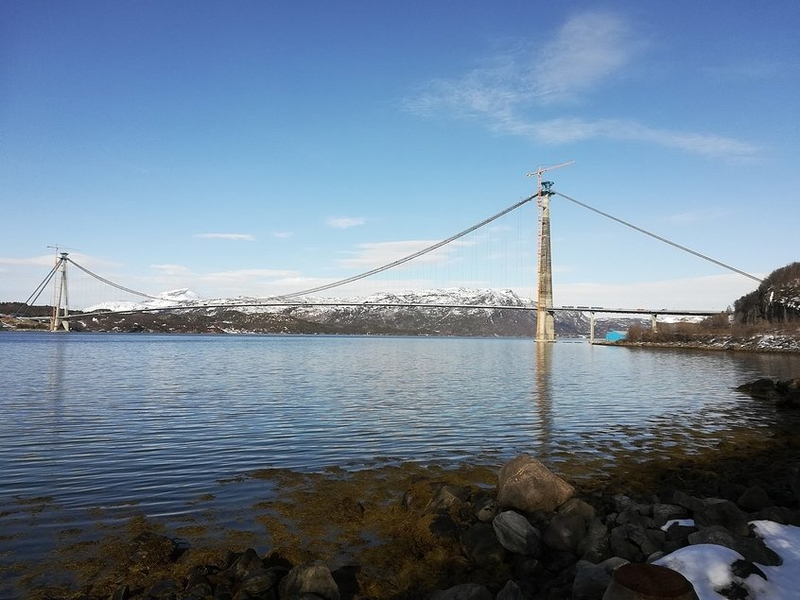 There were also the stringent requirements of the client, Statens Vegvesen Nord Region, for the bridge itself and the construction environment. The first practical problem SRBG faced was language. Norwegian Law requires all bidding documents to be submitted in Norwegian, “a language not in popular demand in China,” SRBG said. “Translators are extremely scarce. To produce bidding documents in Norwegian, a high price must be paid for translation. “What’s more, it is extremely difficult to find a talent well versed in both Norwegian and construction terminology.” However, the project appears to have been a success, and SRBG has won the bid for its second bridge in Norway, the Batstadtsander Bridge. “Although Norway and China adopt different standards, the Chinese side is very flexible, good at learning new things and cooperated well with us,” SRBG quotes a project manager of the Norwegian Highway Administration as saying. On 23 October 2013, a joint venture of SRBG, which is affiliated to Sichuan Railway Investment Group, and VNG from Serbia, won the bidding for the $96m steel structure contract of the Hålogaland project to produce all parts including cables and steel box beams, and to construct the bridge. The project was officially launched on 1 June 2015.